We’ve been having fun with apples at our house this season. Boxes of organic apples picked from a friend’s tree have been made into applesauce, dehydrated apples, and apple cider. We’ve eaten plenty of crisp, fresh apples for snacks. And finally, after almost all of the four boxes of apples had been dried, canned or eaten, we decided to celebrate with an apple dessert! Apple crisp flavored with warm cinnamon and a hint of maple goes great under a scoop of ice cream. What a sweet way to celebrate the season! The topping is simple: Organic oats, raw butter, cane sugar and spice and a touch of maple syrup. Sprinkle right on top of the apples and pop it in the oven! That’s all there is to it…a quick and easy, healthy treat. Somebody get the ice cream while it’s still hot! 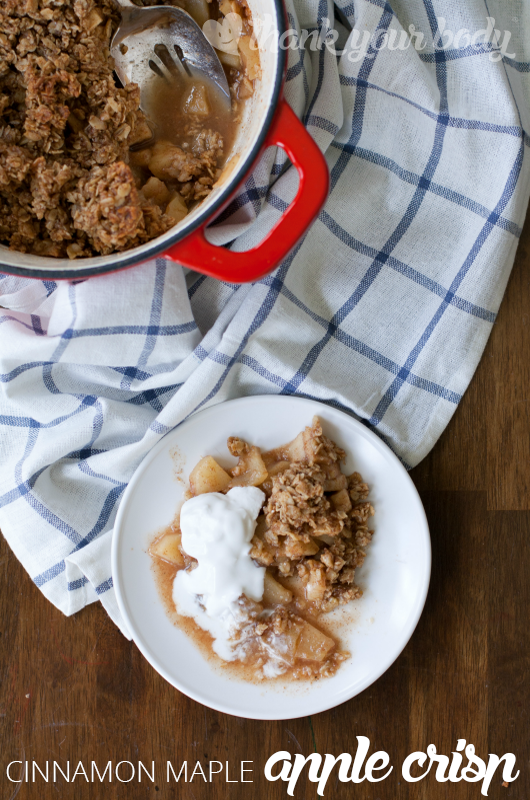 There are so many fun things you can do with apples and this cinnamon maple apple crisp is first on my list. So delicious. Peel, core and slice the apples. Toss with the cane sugar, cinnamon and nutmeg and layer in an oven-safe baking dish. Cream the butter. Add the oats, cane sugar, cinnamon and nutmeg. Slowly beat in the maple syrup and vanilla extract. Crumble the topping over the apples. Bake at 350 degrees, 25 minutes or until the apples are soft and the topping is browned around the edges. Allow to cool for five minutes before serving. What’s your favorite apple dessert?